Last month, we were excited to unveil our 2016 U.S. Corn Yield Forecast. Today, we’re adding soybeans to our weekly production forecasts. The first Descartes Labs weekly soy forecast is 47.89 bushels per acre and 3.98 billion bushels. Though this would be a record for total soy production (previously set in 2015), our yield forecast is slightly below the 48.0 bushels per acre in 2015. By comparison, the USDA is projecting production of 4.06 billion bushels, as of their August report. Their next monthly update is Monday, September 12. The Descartes Labs soy yield is lower than USDA’s. We believe that many other forecast models haven’t captured the effect of August’s mixed weather and its potentially negative impact on “fill,” i.e. the seeds in the soybean pods growing to maturity. Nonetheless, we project 14% of counties to have record soybean production and about two-thirds of counties to be better than their 11 year averages. 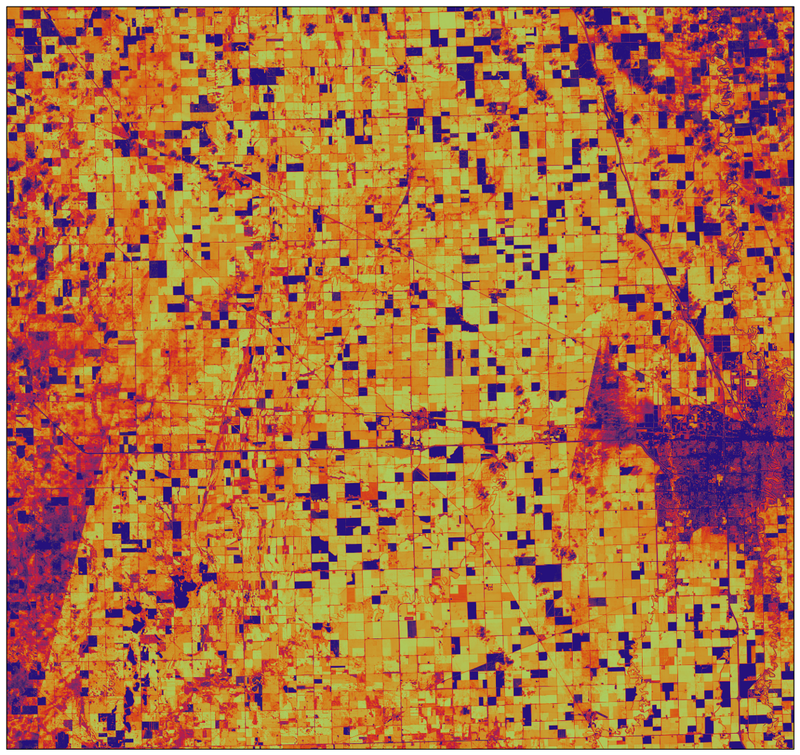 Satellite image showing crop health in Cass County, ND, the largest soy producing county in the United States. Descartes Labs will be updating our forecast weekly on Tuesdays throughout the growing season. You can find numbers for the US and major soy-producing states / counties on our website and mobile apps (iOS and Android). Our model was built by a team of over a dozen scientists, using massive amount of satellite and weather data (3 petabytes and growing) combined with machine learning on the Descartes Labs Forecasting Platform. If you’re a farmer, a commodities trader, or need up-to-date corn and soy yields, download our app or sign up for our newsletter so you’ll have access to the most accurate corn and soy yield forecasts available. If you’re a company looking to utilize the Descartes Labs Forecasting Platform to solve your business challenges in ag or other industries, drop us a line. The US is the world leader in both corn and soy production. Soy is often used in rotation with corn, since it’s a natural way to replace nitrogen in the soil used by other crops. Over 80% of the soybean crop is used for animal feed and oil; the rest is used in human food consumption. Soy is known for its high protein content, making it an extremely versatile food, used for everything from protein shakes to tofu. Soy is a relatively new crop in the US. Before World War II, we imported 40% of our edible oils; with worldwide trade disrupted, we ramped up soy production.